So I thought I’d give an update on how my little pico reef is progressing. I also thought I’d use this oppurtunity to include some technical specs about the kind of filtration and lighting I’m using on the system as well. So first off, an update on whats been going on with the tank. I had a slight rearrange as the alveopora was getting too large for its spot and its polyps were starting to press against the aquarium glass. Now this coral is my personal favourite of the species I have, and so it gets preferential treatment compared to the others! With that said I essentially just swapped the duncan and alveopora around, whilst rearranging my GSP and a few zoas. All in all I think it makes for a more balanced look to the tank, and certainly gives the alveopora more time to spread its wings as it were. Other than that not much has changed, so onto to the technical specs of the tank. 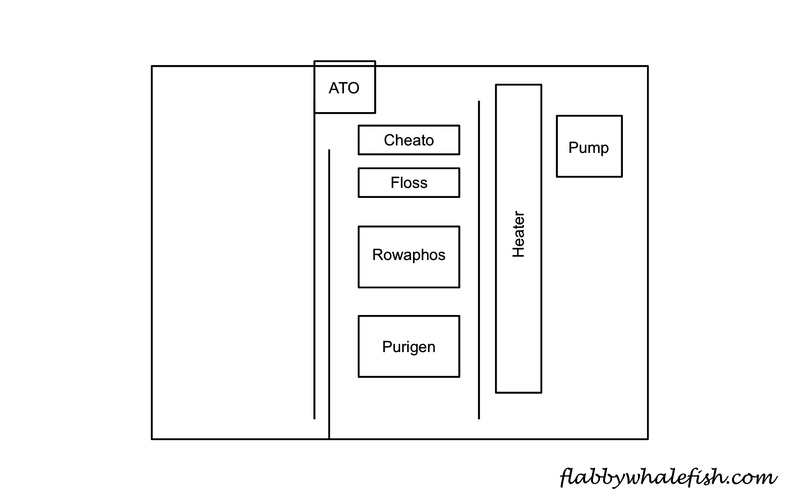 Below is a schematic showing the rear chambers of my tank. Filtration wise I constructed a pretty standard rack from egg crate. On the top of this I have a ball of cheato. Quite how much this contributes to the removal of nitrates its highly questionable. It receives little light and doesn’t seem to grow, so I think you could safely say the cheato was merely surviving rather than thriving. Nevertheless, its is there and will continue to be so until I feel it is becoming detrimental to the system. The next chamber contains filter floss, this gets changed as and when I feel it has reached its limit of removing particulates from the water, normally every 4 weeks. The next chamber contains rowaphos and then there’s purigen in the final one. Equipment wise the pump is the hydor pico 600, and is the only pump providing flow to the tank. I would certainly say that flow it low in this tank, certainly compared to large systems I’ve seen. 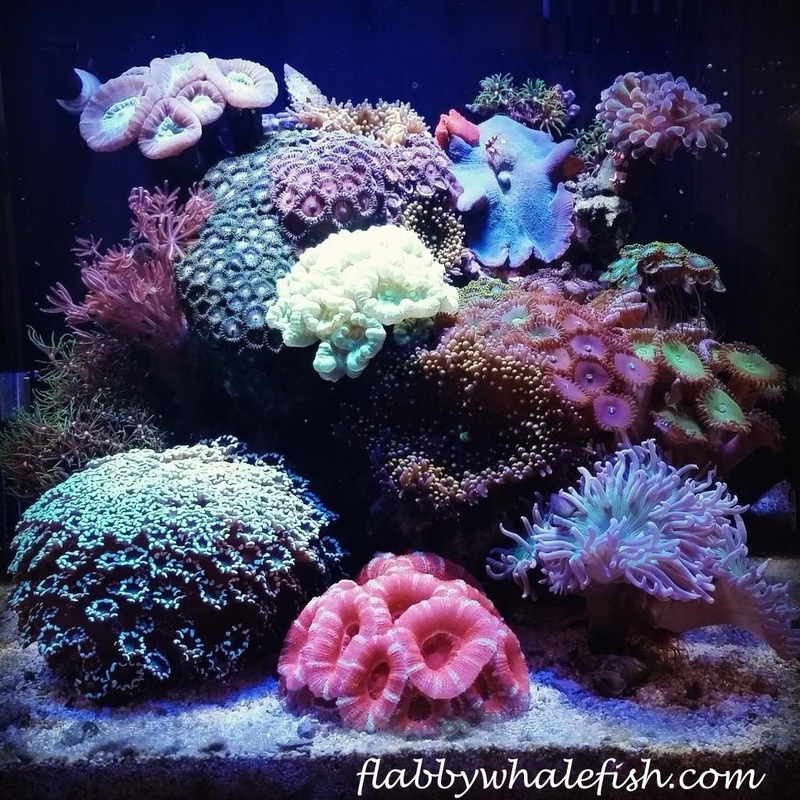 I have experimented with more powerful pumps but have always struggled with regions of very high flow, which I don’t like the look of and I don’t think the corals reacted well to. So for now I have stuck the hydor, and it seems to serve me well. Heating is provided by a 50W Visi-Therm Heater. A solid heater and has not let me down yet. Lighting is provided by a 36W MarineReefLED – PAR38 – Quadspec V2 bulb and a PAR20 – Fiji Blue Bulb. I run the Fiji Blue for 12 hours a day, with the addition of the Quadspec for 5 hours a day. I also have a TMC V2 auto top us system fitted to the tank. And so there we have, a full tech spec and stock list of my tank, hope you enjoyed it! Any other questions feel free to comment. Great post! Just completed a rescape and change onmy tank yesterday after an unforseen crash 😦 Great job on yours!